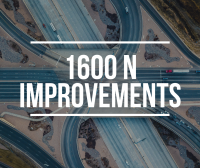 The City of Orem, in cooperation with the Mountainland Association of Governments (MAG) and Lindon City, commenced the Transportation Improvement Study in 2017 to determine current and future needs for widening 1600 North from I-15 to State Street from two to four lanes. Due to funding limitations, the project widening may not occur until after 2024; however, some construction in advance of this may occur depending on regional transportation needs. The City of Orem will continue to seek public input throughout the Transportation Improvement Study process. More information, including diagrams of the 3 potential options are available at orem.org/1600N Click here to make comment.